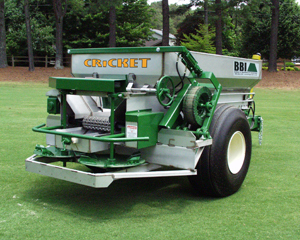 Cricket Ag and Turf - The BBI Cricket Ag and Turf Fertilizer Spreader is a precision fertilizer spreader designed for the golf course or other turf environments. The Cricket Ag is ideal for Golf Courses, Turf, Sod, Food Plots and Small Farms. Various options are available to adapt the unit to particular needs of each environment. SS Spinners and Fins, S6 CV PTO, 16" Mesh Chain, Perfect Hitch, and Heavy Duty Jack are standard and included in list price.